Did Dem Die in Dallas? The 1,000-man withdrawal from Vietnam was originally planned to take place during the election campaign of 1964. However, the Buddhist crisis erupted in April 1963 and proceeded during the summer to knock the political bottom out of the regime in Saigon. At the May SECDEF conference, as the crisis was unfolding, McNamara announced “concrete” plans to withdraw 1,000 men, not in 1964, but by the end of 1963. Kennedy needed a recommendation to start the withdrawal in 1963—and he needed it right away. He needed to start the withdrawal early and had do it without being publicly associated with the military optimism accompanying that recommendation. 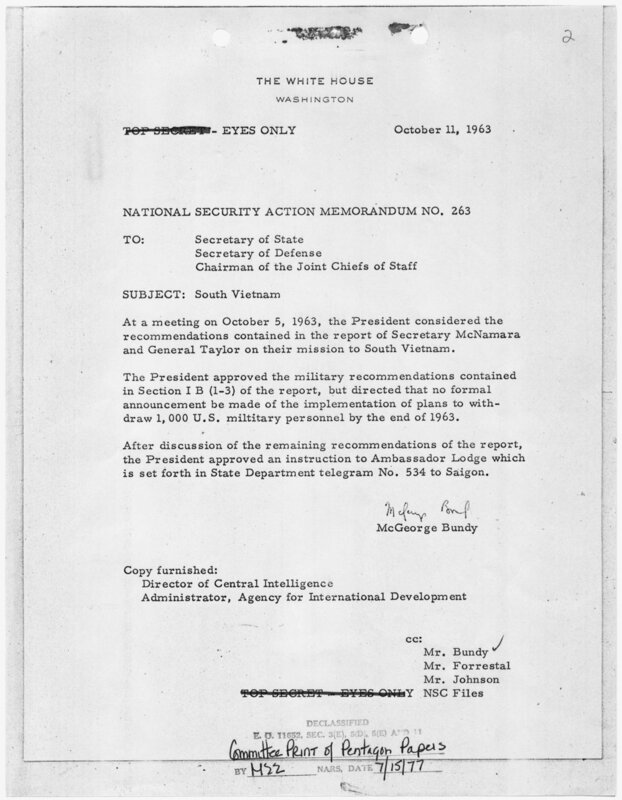 Kennedy accomplished that by having McNamara make the recommendation. Kennedy and McNamara steamrolled their opposition in the uproar that occurred when Kennedy made McNamara announce his recommendations to the press on the steps of the White House on October 2, 1963. The military recommendations in Section I B (1-3) of the McNamara-Taylor report were these: 1) that MACV and Diem come up with what had to be done to complete the military campaign in I, II, and III Corps by the end of 1964 and IV Corps by the end of 1965; 2) that the training program be established so that the South Vietnamese could take over essential functions and permit the bulk of American forces to be withdrawn by that time; and 3) that the Defense Department should announce “in the very near future” the 1,000-man withdrawal.